The Zanesville Express, and Republican Standard (Zanesville, OH) lists James Caldwell with 680 votes. The Supporter (Chillicothe, OH) lists James Caldwell with 614 votes and Bazaleel Wells with 110 votes. The Zanesville Express, and Republican Standard (Zanesville, OH) lists Bazaleel Wells with 23 votes. 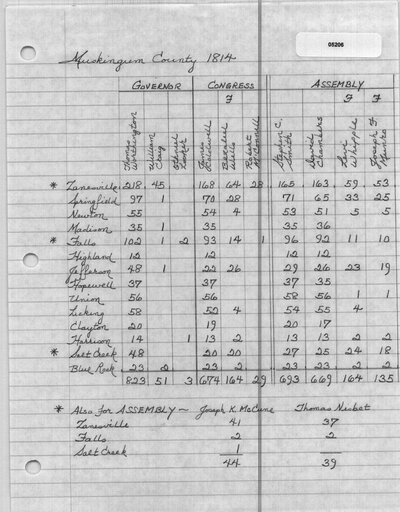 Original Hardy Township, Coshocton County Election Returns. Ebay Item #302503249, Auction Ended, April 16, 2000. 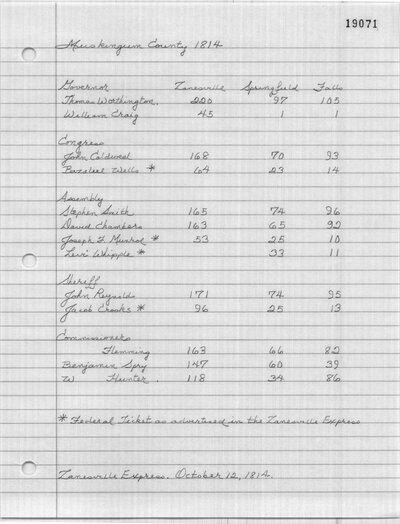 Original Linton Township, Coshocton County Election Returns. Ebay Item #381123305, Auction Ended, July 22, 2000. Original New Castle Township, Coshocton County Election Returns. Ebay Item #237210329, Auction Ended, January 23, 2000. Zanesville Express, and Republican Standard (Zanesville, OH). October 12, 1814. Muskingum Messenger (Zanesville, OH). October 19, 1814. Ohio Federalist (Saint Clairsville, OH). October 19, 1814. Zanesville Express, and Republican Standard (Zanesville, OH). October 19, 1814. Muskingum Messenger (Zanesville, OH). October 28, 1814.